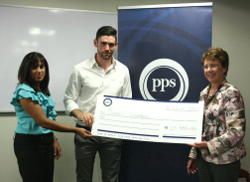 PPS, the Financial Services Provider for graduate professionals, has awarded three students at the University of the Witwatersrand one scholarship and two bursaries to the as part of an ongoing effort to provide much-needed financial assistance to university students across the country. PPS is an authorised financial services provider. Statistics released in 2012 from the Human Sciences Research Council show that South Africa’s Higher Education sector has an alarming 40% drop-out rate among students, with financial difficulties suffered by poor black students being cited as the main reason. “We understand the financial pressures that exist among many students in completing their studies and with this in mind we aim to assist students through the PPS Bursary Awards,” says Mike Jackson, Chief Executive at PPS. Wits Engineering student Daniel Goldberg received a scholarship, while Abel Mosito, also studying towards his Engineering degree, and Sanele Freedom Njoko, studying a Business Science Engineering degree, both received bursaries. For the current academic year, PPS awarded a total of 18 bursaries and two scholarships to the total value of R1-million. 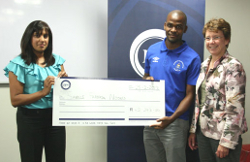 These bursaries and scholarships are paid directly to the university where the recipient is studying and are administered by the university to cover university fees and textbook costs. All applicants that met the minimum requirements to qualify for these awards will receive a book voucher with complements of PPS. 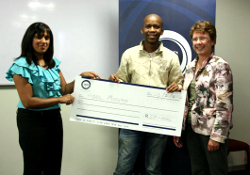 This year’s bursaries have been awarded to learners at a number of institutions including the University of Cape Town, University of Pretoria, University of KwaZulu-Natal, University of Johannesburg, Stellenbosch University, Nelson Mandela Metropolitan University, University of Fort Hare, University of Limpopo, Walter Sisulu University, University of the Free State, Rhodes University, University of the Western Cape and University of the Witwatersrand. The students also study across a range of disciplines including Engineering, Nursing, Information Systems, Accounting, Psychology, Law, Pharmacology, Agricultural, Veterinary Science and Microbiology. “We are confident that these promising young learners will go on to contribute to the improvement of our society and make great strides in whichever career they choose,” concludes Jackson. PPS boasts in excess of 200,000 members who enjoy access to a comprehensive suite of financial and healthcare products that are specifically tailored to meet the needs of graduate professionals. PPS is the largest South African company of its kind that still embraces an ethos of mutuality, which means that it exists solely for the benefit of its members. Thus, PPS members with qualifying products exclusively share in the profits of PPS Insurance and those who have PPS Investments products can also share in the profits of PPS Investments. PPS membership provides access to the following tried, tested and trusted products and services: PPS Insurance, PPS Short-Term Insurance, PPS Beneficiaries Trust, PPS Investments and Profmed Medical Scheme. Visit www.pps.co.za for more information.